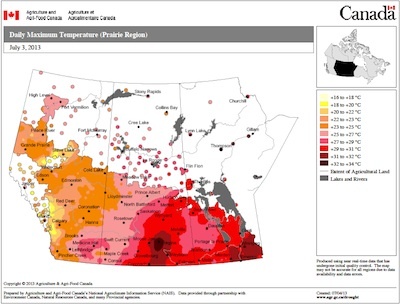 It’s looking like a hot week across the Prairies. The map above shows the highs for July 3, with many regions with highs of 30C+. (Click on the map for a bigger version.) Canola doesn’t like heat, especially at flowering. Heat can cause bud and flower blasting, resulting in blank pods and lower yield. But heat isn’t the only possible cause, as you’ll read in the article below. Hot and dry temperatures can also reduce the sclerotinia stem rot risk, but heat alone does not lower the risk substantially if fields had average to above average moisture before, and if the canopy continues to have morning dew and high humidity. 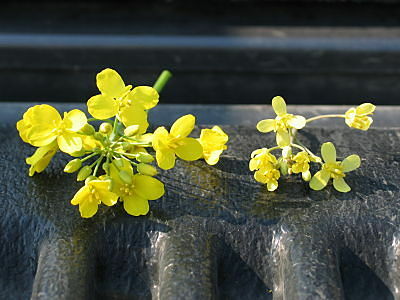 Sclerotinia stem rot management begins as canola comes into flower. 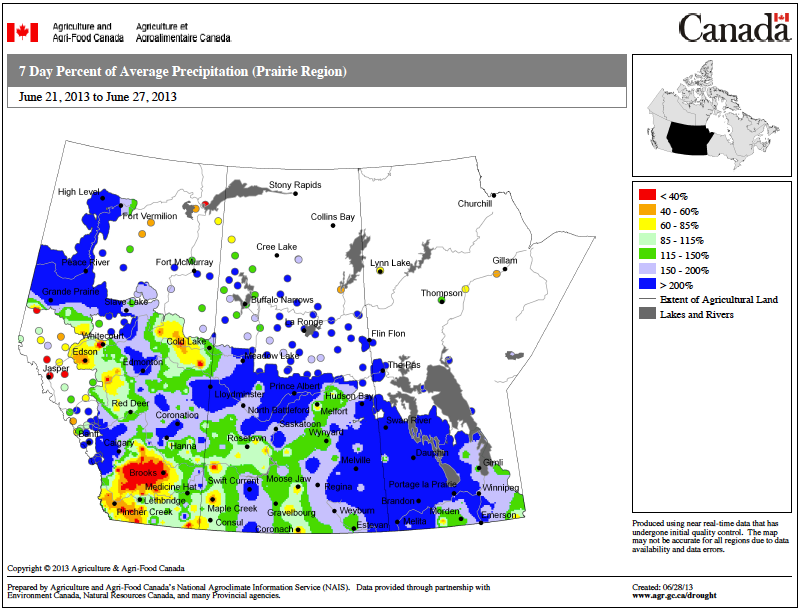 Canola with average to above average yield potential and good soil moisture are at higher risk, and could see an economic return from fungicide. 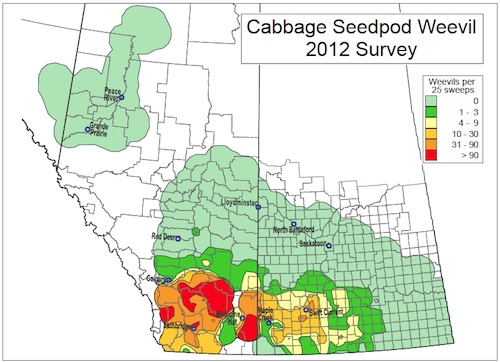 Cabbage seedpod weevils seem to be moving north and east in Saskatchewan this year, with canola fields near Moose Jaw and just south of Outlook having the insect at higher numbers. 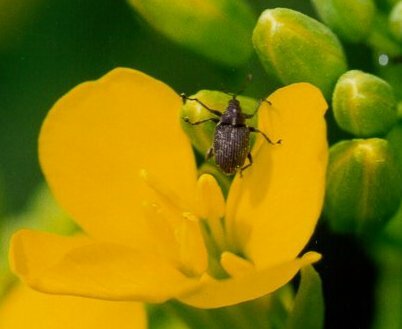 The time to spray, if thresholds are at 2+ weevils per sweep across the field, is around 20% bloom. Why are the two halves of this field so different? 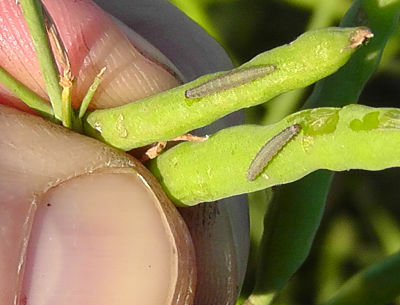 The most accurate method to estimate diamondback moth population density in canola is to count larvae in several locations throughout the field, and determine the average population per unit area. Moisture has a much larger influence than temperature when it comes to sclerotinia risk. Infection can be high in hot weather as long as the moisture is there. Moisture can come from rain, relative humidity in the high 80s, or morning dew. Dew and high humidity can provide enough moisture for sclerotinia stem rot. If your pants get wet walking canola fields in the morning, there’s enough moisture for the sclerotinia infection cycle. 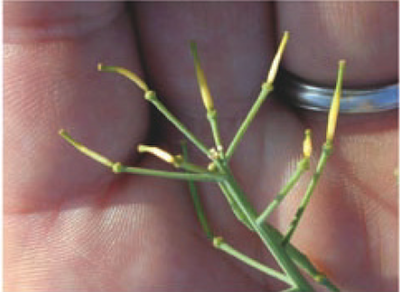 As canola starts to move from flowering and into pod formation, growers will often notice blanks up the raceme where pods did not form. Here are 7 possible reasons. Weevils and lygus feeding together. Threshold? 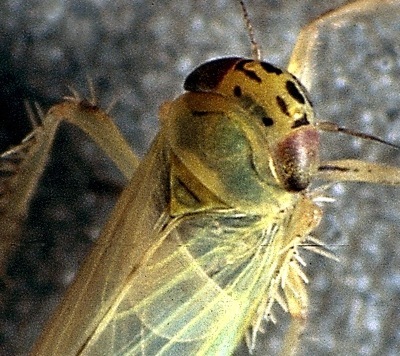 Leafhopper populations are building, which could increase the risk for aster yellows. Even so, there is not really a good case for spraying for leafhoppers in canola. Why not? The ideal time for a sulphur top up is any time before flowering, but a top up at early flowering may pay off if plants are showing signs of sulphur deficiency. 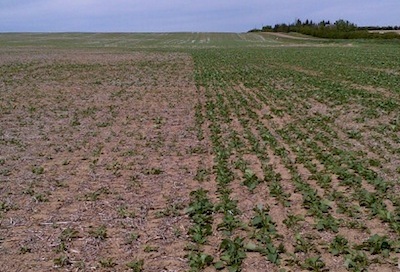 The ideal time for a nitrogen top up is before the 5-leaf stage of canola, but AAFC research out of Indian Head, Saskatchewan, shows that nitrogen top dress as late as 5-10% flower can still provide a yield benefit. Three of the top 10 have to do with moisture, the key risk factor for sclerotinia stem rot.